Competing in the materials and surfaces category, the Reveal products are a series of carved and textured bamboo panels. Plyboo Reveal features a spectacular visual effect, which is created by the interplay between the exterior layer and a revealed inner core. Offered in eight different patterns and color options, the Reveal line is also remarkable for its stability, a quality it achieves through Plyboo’s proprietary RealCore™ technology. That technology, along with bamboo material layered in a bi-directional layer format, ensures consistency in the revealed cores. Why Plyboo Reveal? The Reveal bamboo panels are ideal for open-concept office spaces where ambient noise and vocal collaboration can often become distractions for other workers. Its acoustical-dampening effect works to mute the cacophony of sounds that tend to float through those attractive yet sometimes impractical spaces. A well-placed selection of the 4-by-8, .25-inch-thick panels, which are available pre-finished or unfinished, can help accentuate the visual appeal of office spaces while also helping to make them more comfortable and enjoyable places to work. 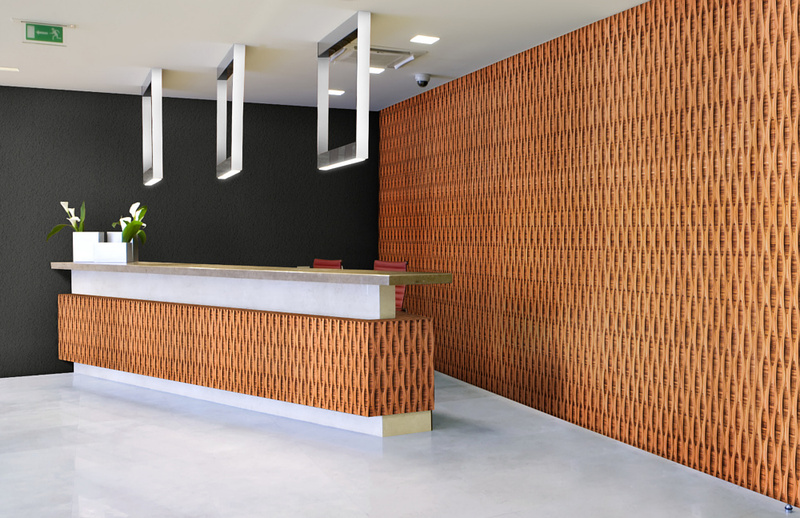 Beyond wall panels, they are also excellent options for elevator lobbies and cabs, reception desks, focus walls or simply as artistic adornment. Plyboo Reveal’s environmental benefits The Reveal collection is not only notable for its beauty and stability, it is also an eco-friendly option for homeowners, contractors, designers and developers who are looking to make their structures and spaces more environmentally sustainable. Made from rapidly renewable bamboo that is also certified by the Forest Stewardship Council, the Reveal products are good for 3 Leadership in Energy and Environmental Design (LEED) credits. LEED has become the environmental standard that owners and developers of new and renovated buildings are attempting to achieve in their effort to meet the requirements of a changing world – one that is more aware of environmental techniques in all facets of daily life. Discovering and voting for Plyboo Reveal If you would like to learn more about Plyboo Reveal, go to the Plyboo website, where you can find specs and pricing for various products in the line. And once you’re aware of their many benefits, you can go to the voting page for the Interior Design awards.